The June solstice is the Summer Solstice in the Northern Hemisphere and the Winter Solstice in the Southern Hemisphere. The dates vary between June 20 and June 22, depending on the time zone and the year you are in. June Solstice in India is on from Tuesday, June 21, 2016. The June Solstice in Universal Coordinated Time is on from Monday, June 20, 2016. June 16, 2016, today you can see the bright waxing gibbous moon soon after the sunset. As dusk gives way to darkness, look for the red planet to pop out in the moon’s surrounding area. As Mars shines so brightly in Earth’s sky in June 2016, and we expect this world to withstand tonight’s drenching moonlight and to be a spectacular sight near the moon. As nightfall, watch for the planet Saturn and the star Antares to join up with the moon along with the Mars on this moonlit night. Both Antares and Saturn are respectably brighter but neither can come close to beat the brilliance of Mars. Look for Mars to surpass Saturn, and for Saturn to outshine Antares, the brightest star in the group Scorpius the Scorpion. At present, Mars shines 5 times more vibrantly than Saturn, and about 12 times more brightly than Antares. As we all know that Mars and Saturn are planets, and so the worlds shine by reflecting the light of the Sun. Antares, on the other hand, is a star that shines by its own light. Both Mars and Saturn are the planets that shine so reflected than sunlight. As seen in Earth’s sky, the brightness of the fourth planet Mars, outwards from the Sun and varies much more greatly than the brightness of Saturn. However, that’s not an intrinsic difference in Mars’ brightness; but it’s the distance difference of the Mars’ from us, and also something called opposition surge. Mars distant point from Earth lies some seven times farther away than at its closest; and at its brightest, Mars shines 50 times more brightly in our sky than it does at its faintest. Saturn, the utmost world that we can easily see without any help eye, lies only about 1.5 times more distant from Earth at its extreme point than at its closest point. It the brightest and is about five times brighter than at its faintest. Saturn’s brightness is not only determined by its distance, but also by the angle of tilt and its highly insightful rings with respect to Earth. Saturn’s greatest brilliancy in our sky happens when Saturn is contiguous to Earth and its rings are maximally tilted our way. This was last happened during the opposition of December 31, 2003, and will next happen at the opposition of December 24, 2032. The Jupiter’s difference in brightness is less than that of either Mars or Saturn. Jupiter is about three and one-half times brighter at its brightest than at its faintest. 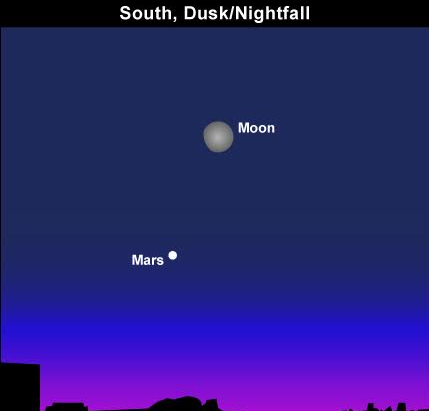 On June 16, 2016, use the moon to find Mars, whose difference in brightness far exceeds that of any other bright planet orbiting the sun outside Earth’s orbit. In addition to Mars, the other two bright superior planets are going to be Saturn and Jupiter. Button line: Being the best brain kids knowing this information not only help you to grab the knowledge about our planets and their moments; but also makes you learn about new and exciting things every time. So friends go and enjoy watching the bright red planet near the moon on June 16, 2016.